I think that Tayside Police do a great job in the ways in which they use social media. It is important that the police effectively communicate with the people they serve. Social media can play an important role in this. There is a need for greater moderation of posts on these sights and people need to take responsibility and act properly online, as elsewhere. I would be very unhappy if the actions of a few people caused Tayside Police to engage less. Adapting to use new media is important for all public services, including the police. There are challenges in this but public bodies need to find ways around these challenges and deliver services fit for the twenty-first century. Along with council officers and ward colleagues I took part in a walkabout in the Logie Estate. It was a shame that there were no local residents present. I am always happy to take up any issue from constituents in the Logie estate. I was really pleased that my colleague Jenny Marra MSP raised the concerns of the Community Spirit Action Group about bus services in their area. Jenny was speaking during a debate about bus services in the Scottish Parliament. Community Spirit have done an excellent job of making the views of people in the Pentland and Ancrum areas known about the poor bus service. I am clear that what is required is greater regulation. Bus companies must offer a service it is not good enough for them to merely cherry-pick profitable services. To find out more about Community Spirit click here. Along with ward colleagues, council officers and most importantly local residents I took part in a walkabout in the Pentland estate this morning. This is a chance to highlight to problems to council officials. The main issues today were the state of some of the steps throughout the scheme and grass cutting on the verges. The council needs to tell people what they can expect with regard to grass cutting and stick to it. There is to some road resurfacing in the area before the end of the month which hopefully will deal with some of the issues to do with potholes. 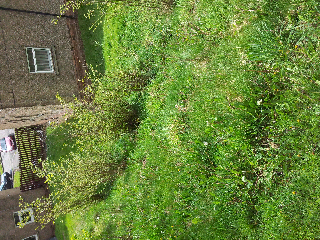 The photograph shows some of the problems with the overgrowing verge or banking. If you have any queries about any issue in this area please get in touch with me. Tonight saw the last meeting for this session of the City Council and its various committees. The meeting started with those who have chosen not to come back making their valedictory speeches. I was sorry that my colleague Bailie George Regan was not able to attend, but it is important to remember George's years of service to the people of Dundee and the Labour Party. My ward colleague Jim Barrie is also standing down, whilst I do not agree with Jim politically it has been good to work with him over the last five years. As a local resident I have always thought that Jim has the best interests of the West End at heart. The SNP candidates to replace him face an uphill task in being as good local candidates as Jim , not least because unlike Jim they are not local residents. At the Environment Committee I sought a reassurance that constituents are safe from the possibility of gas problems caused by Riverside Landfill site. I was pleased that the officers were able to offer some reassurance on this issue. I welcome investment in the Howff Graveyard, this is an important historic landmark in the city and it is should be protected. I spoke about the continuation of the scambusters team. There is a review of the funding arrangements for this important service. I highlighted how constituents had highlighted how they had been impressed by the Scambusters Service. They do a great job helping people be aware scams, there is also a lot of work to be done against loan sharks and even 'legal loan sharks' in my opinion. I was pleased to be given an assurance that this service will be maintained. At the Policy and Resources Committee I spoke about the proposed new concourse at Dundee Rail Station. I welcome the proposals for the rail station, there is a real need for the investment. I hope that the people of Dundee will get involved in the formal planning process which will be brought forward now. It is important that they make their views known about the design, just as they did for the V & A. With regard to funding for the project, there is funding gap of £2.2 million. The council hopes to convince Network Rail to close this funding gap. The report states that this is not the type of project that Network Rail usually pays for. As someone who regularly uses the rail network it seems to me that Network Rail has invested elsewhere in places such as Edinburgh and Glasgow. Given that Network Rail belongs to the people of the UK I wonder whether we should not have been making a stronger representation on behalf of the city of Dundee to Network Rail demanding that this funding is committed from Network Rail. It doesn't seem like five years since I was first elected to the City Council; I hope that the people of the West End will re-elect me on May 3rd. Today I visited the Maggie's Centre in Dundee, which is in the West End ward near Ninewells Hospital. It was a great opportunity to hear about the excellent work done at the centre. I know from people who have used the Maggie's Centre that it has been a great help to them. I know how devastating cancer can be to those diagnosed and their families. It is important that people can get help and support when they need it and the Maggie's Centre offers this help. The Frank Gehry building is fabulous and well worth seeing. 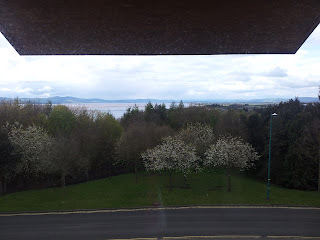 The picture shows the view from the building down the Tay. Maggie's Centre is not supported by the government, it is not part of the NHS, it is a separate charity and is well worth support. You can read about fundraising efforts here. The Maggie's Centre is a fantastic place doing such a good job for people at a pretty desperate time.